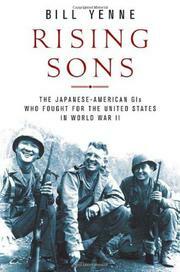 Indifferently written but thorough account of the Nisei soldiers who proved their loyalty to the U.S. in the face of racist convictions—and won more combat decorations than any other unit in history. The Japanese attack on Pearl Harbor and the internment of Japanese Americans resident on the West Coast cast deep suspicions on the young Nisei men who rushed forward to volunteer for combat even as their families were being sent to Manzanar, Heart Mountain and Poston. Yet, chronicles military historian Yenne (The American Aircraft Factory in World War II, 2006, etc. ), the military authorities quickly recognized their value; those with some command of the Japanese language were enlisted as linguists and interrogators in the Pacific Theater, and the rest were gathered into the 442nd Regimental Combat Team and sent to the Mediterranean Theater. As with the Tuskegee Airmen, they found detractors among their fellow soldiers at first—but very few, Yenne writes, “who had actually seen them in action.” Soon the “little Hawaiians” had earned a deserved reputation as bunker- and line-busters who led the way against the ferociously defended Apennine line, fought bravely in France and liberated Dachau. Yenne cannot resist a cliché (“German bullets had no regard for the color of one’s skin, nor for the birthplace of a grandmother”), and the narrative is strangely flat for all the attendant drama of combat. Even so, it is well to remember the contributions of men such as Daniel Inouye, who lost an arm in combat and later went on to serve as senator from Hawaii, and Takejiro Higa, a combat linguist who helped save untold lives at the Battle of Okinawa, to name just one of the interpreters who, the Army reckoned, saved a million American lives. Yenne’s account has its moments, but Robert Asahina’s Just Americans: How Japanese Americans Won a War at Home and Abroad (2006) is the better book.